eBay has signed an agreement with Cox Automotive to acquire the Motors.co.uk classifieds site for an undisclosed sum in a move to enhance its Gumtree UK business. 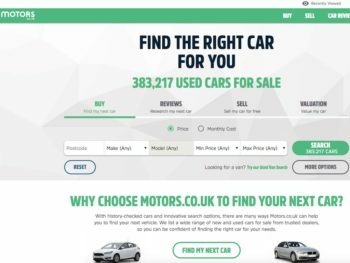 Motors.co.uk is used by around 5,000 dealers to sell cars and has more than 350,000 used car listings on its platform. The acquisition, which is subject to approval by the Competition and Markets Authority, is expected to significantly expand the reach for dealers and would jointly position Motors.co.uk, Gumtree UK, and eBay Motors UK — which together offer more than 620,000 car listings — “as a leading alternative to the current UK motors market leader”. The transaction is expected to close before the end of Q1 2019.